This top 10 of WordPress blog themes is our answer to the problem of finding an original blogging HTML theme. All to this top included designs have all it takes to be a really great option for bloggers that want a stylish and premium look for their personal blog. We can promise you that these WordPress blog themes will make your blog stand out! All of them have lots of great options like shortcodes, sliders and header variations. All the themes are built from the ground up to give the best reading experience on all devices. These WordPress blog themes will automatically fit the screen no matter which device you are using. The top themes have added the best features into: change the background color, change the size of the font and even read in fullscreen mode too. There is no better way to present your personal stories as to upload all of them to your own place on the internet. If you are looking for a new experience for your blog – take a close look to this top 10 we are presenting to you already. This WordPress blog theme is a powerful and flexible theme that focuses on providing functionality for blogs and informative sites. The theme is built with ease of use in mind. All of the included features have been tested and include very simple interfaces so you don’t need to edit any kind of code at all. You should be able to adapt it to your needs fast and easy. Backstreet was designed to be fully customizable, with just a few clicks and keystrokes, you can changes the site’s layout, colors, images and messages. Try this modern and functional WordPress blog theme Backstreet and show up your mind for others. This WordPress blog theme lets you to customize the look and feel of your site without the need to have any programming experience, however, if you are a developer and want to take your site even further. Send automatic notifications every time you publish a new post or grab your twitter feed and display it on the site. Magzimus leverages the power of social media and allows you to easily connect to a twitter account. Magzimus includes some great tools like a custom CSS editor where you can add styles directly from the admin panel, this way, you won’t have to touch the theme’s css files and next time the theme is updated, you will be able to upgrade without worrying about losing your changes. This WordPress blog theme is the perfect theme for the creative agency, freelancer or general business. Strong lines, strong colors and a bunch of super-awesome features to keep you busy. This portfolio and blog theme Studiofolio allows you to set a custom background for each individual post, page and portfolio project. A super-quick way to get creative with your site. Support for post formats means you can jazz up your blog with your own self-hosted video, audio, images, galleries, asides, links, quotes and of course good old standard posts. This WordPress blog theme is a powerfull theme for blogging and any website, packed with awesome features and simple to use. Supports unique style for categories, pages and posts, including many visual elements, headers and backgrounds. Fully compatible with latest WordPress versions. Continuum is guaranteed to increase both the average length of time that your users spend on your site and the average number of pages that they view. Supported by all major browsers. This WordPress blog theme is a grid-based, layout-shuffling, finger licking theme with support for all sorts of content – it’s responsive to boot. Show off galleries, quotes, links, video, audio or good old standard posts. 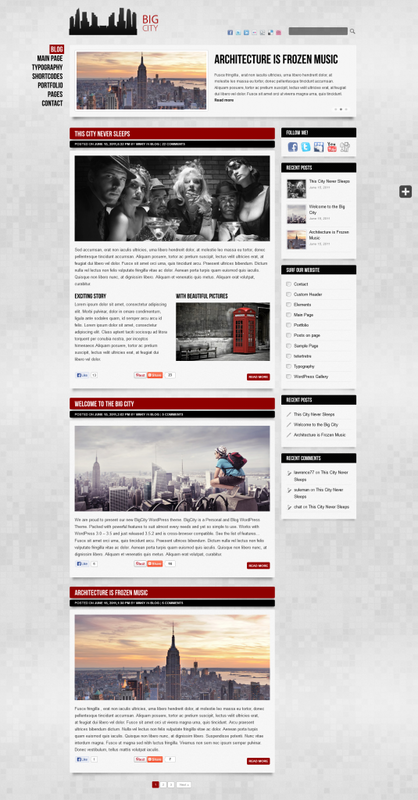 With Big City theme you’re sure to find a look to suit your blogging needs. 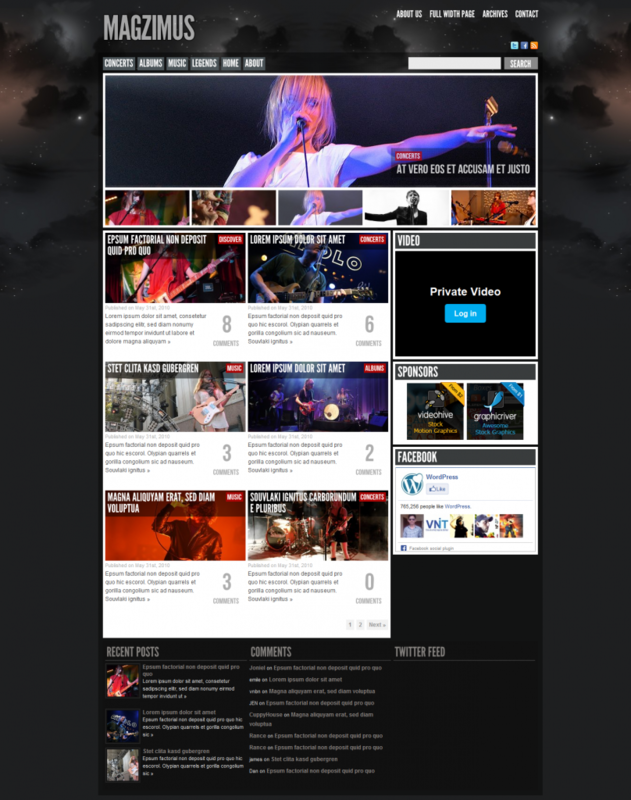 Serve an optimized version of the volumes theme to your visitors using tablet and mobile devices. This WordPress blog theme looks good on any device, from big desktop monitors to small smartphone screens. SimpleMag comes with 500+ fonts from Google font library with preview, for both titles and text. SimpleMag comes with a child theme support. Upload the child theme and customize your site without changing the parent theme core files. This WordPress blog theme have created a very nice and lightweight shortcode generator plugin with very understandable and intuitive interface. This WordPress blog is a clean, modern, powerful WordPress tumblog-style theme designed for a wide variety of uses from bloggers to design portfolios. The responsive web design adapts from large to mobile screens, just resize the browser window to test it out, no additional setup required! The theme Blue Blog also includes a handy custom bio widget to quickly tell your visitors about yourself with photo, link, bio and social media links.This theme is perfect choice for your personal blog, photography blog, corporate blog theme or creative blog.